I just recently moved, and boy was it exciting and whelming all in one… In the very beginning, I found myself looking around saying, “Where do I start?” Just the thought of packing made me take a deep breath because there was so much to do. I’d been in this particular location for quiet sometime, so you know what that means… Yes, LOTS of PERSONAL BELONGINGS! Besides, I’d grown, evolved and cherished lots of quiet moments just being in my home. And out of all the rooms, my office space was very sacred to me in that I spent many hours in there reading, writing, thinking, sitting quietly and creating amongst other things. So naturally, when it came time to pack-up, I had mixed feelings. On one hand, I began to feel a sense of loss because I had received revelation and inspiration there. On another hand, I dread tackling the packing part of moving, especially overhauling my office, because I had over 350 books that needed to be boxed up. Moving on can take one through many emotions very quickly. It causes you to really evaluate those things around you and within you. But, the one thing I learned most from this particular experience was moving on “requires one to do some deep soul searching” in order to get ready for the next phase… Now I’d move many times before as being in the military requires one to be constantly ready, but this move was like none other. This is what I learned and want to share…. 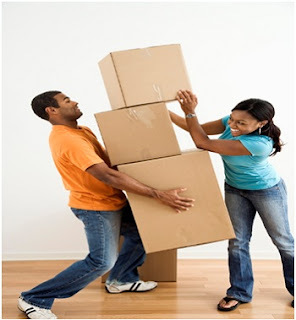 Looking at moving from a negative perspective and depending on what “the move” is associated with, could signify failure, nonsuccess and unfulfillment or disappointment in the eyes of the mover. But, if one looks at moving from a positive perspective, it signifies advancement, personal growth and development, as well as progress… As, moving brings about new vision, adventure and renewed hope. Here, you begin to see the manifestation of your efforts. TAB, I THANK YOU for your kind words, you've always been a supportive friend "Big Bro!" It's all done to Edify GOD (Show God's Love Through My Works) and For the Betterment of those whom my path cross to Encourage, Empower and INSPIRE Individuals to "BE THE VERY BEST THEY CAN BE," Fulfilling Their Purpose and Destiny!